Trent Abbott was startled and a little confused by this unusual greeting. He was wearing jeans and a T-shirt. Nothing special. The man doing the talking was Chuck Croteau (like Chateau) and Trent’s broken Porsche was sitting outside Redline Service in Tucson Arizona. Chuck cleared up the “clothing” reference by pointing to the large Suixtil decal on the side of the Porsche and informing Trent that he loved Suixtil clothing and appreciated others who did likewise. It was the day before the beginning of the Copperstate 1000 and Trent and his wife Jennifer had shipped their 911 down from their home in Omaha, Nebraska and were taking it for a short run when they lost first and reverse gears. 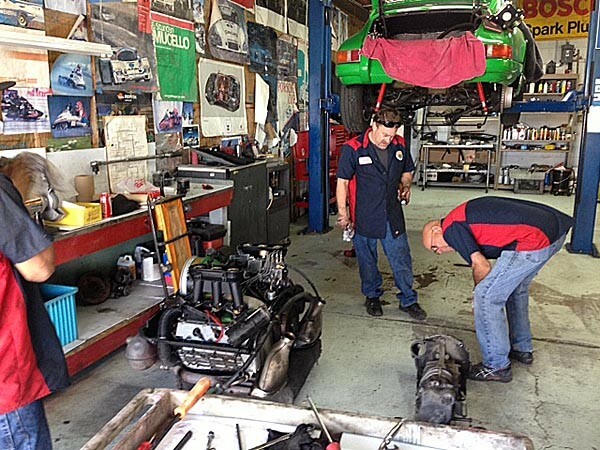 So the day before the event, here they were in the yard of a busy Porsche specialist who had the power to make their week happen with their 911 or relegate them to a sponsor’s Lexus. Chuck dropped everything, tightened the tired shift linkage, told them to pray it would hold and sent them on their way with a surprisingly reasonable bill. It didn’t and two days later it was back on a flatbed. Chuck’s guys had the engine and transmission down and apart in 42 minutes and four hours later they had repaired the transmission tuned the carbs and that evening Trent rejoined the rally. He calls Chuck “The Porsche Whisperer“. Redline Service has been in the MMR Goods & Services under “Porsche Service” since we learned about his company from enthusiasts in Scottsdale two years ago. Trent finished the Copperstate 1000 Rally in his 911 and learned what we always say at MMR has a smidgen of truth. There are only two things in life; Good times and good stories. If you are ever in Tucson, look Chuck up at Redline Service. He’s one of us. Oh, and wear your Suixtil shirt. Chuck likes that.